So the only real surprise here is that somebody bothered to look — because the Manaforts and Cohens of this world usually get a pass. And they would have gotten away with it, too, if Donald Trump hadn’t decided to run for president. So what looked like a great opportunity for both of them to keep grifting and cheating US taxpayers will now turn into some hard time for both. Even though serious crimes were uncovered, Trump and his base call this a “witch hunt.” In the president’s case that makes sense. He is feeling the heat and his main goal now is to cast so much doubt on the investigation (and the media reporting on it) that his supporters will go on the barricades for him when the other shoe drops. But the coal miner in West Virginia, the cop in Texas, the farmer in Iowa, and the office worker in Colorado should ask themselves why they would get tossed in jail for a minor infraction while people like Manafort and Cohen usually get away with defrauding the American people of millions of dollars in unpaid taxes. We could score some easy laughs here by quoting Trump when he said that he hires only the best people. Lots of other commentators have. Or that he is draining the swamp by hiring criminals who then get put away. But that would assume that Manafort and Cohen are exceptions. We don’t think that’s the case. The only thing that’s exceptional here is that a team of prosecutors with subpoena power put these Trumplings’ shady dealings under a microscope. On the other hand, we are also not saying that every big-shot lobbyist, every influence broker, or every mega-rich person is a crook. But each of them — or the people on their payroll — understands how the game is played much better than less wealthy Americans. They know every legal and not-quite-legal loophole — in some cases because they helped get them passed into law. Most importantly, they know that there is a slim chance of getting prosecuted for skirting — and sometimes crossing — legal boundaries. And, as the Manafort trial has shown, they have help from bankers and accountants who want a piece of the pie. So Manafort and Cohen are very likely not exceptions — and hopefully not the rule. It would be in the public interest to find out exactly how common these types of crimes are and how much money is lost to taxpayers by people who defraud the government. Two other cases this month have gotten much less attention: Rep. Chris Collins (R-NY) was indicted for insider trading and Rep. Duncan Hunter (R-CA) for using more than $250,000 in campaign contributions for personal expenses. Lots of news stories have pointed out that these two were the first congressional lawmakers who endorsed Trump, but that is largely irrelevant. In fact, for those worried about the rich and powerful defrauding the US, it’s counterproductive to pretend that this is a Trump-related problem. It’s a “We are above the law” problem. There are plenty of Democratic lawmakers who have been convicted for corruption and other crimes. Special counsel Robert Mueller earlier this year reportedly referred some cases to the US Attorney’s Office for the Southern District of New York; they are said to include Democratic lobbyist Tony Podesta and former Obama counsel Greg Craig. It would also be foolish to believe that only conservatives park their money in offshore shell companies or illegally evade paying taxes in other ways. This week, Sen. Elizabeth Warren (D-MA) introduced legislation that addresses lobbying excesses and the revolving door between Congress and K Street. However, even if passed, which is highly unlikely, this would only address part of the Washington side of the problem. What the Manafort trial and the Cohen plea have shown, and what may become even more apparent if Mueller keeps rolling up the entire Trump cabal, is that it’s worth scrutinizing the finances of the super-rich as never before. For one thing, it makes fiscal sense. You could pay a unit of experts a lot of money to uncover the financial crimes of the wealthiest Americans and the recouped tax payments would more than make up for any expense. In addition, the laws for accomplices, such as accountants, bankers, “fixers,” etc., should be changed. The penalties for their involvement in financial crimes should be much more severe. However, there should also be incentives that would make it worth it for them to come forward as whistleblowers. For example, if you expose a tax dodger who is cheating the US government out of between $100,000 and $5 million in taxes, you get 50 percent of that money and 10 percent of any amount above that. In other words, make it so lucrative to blow the whistle that wealthy tax dodgers can no longer trust anybody to help them cheat. In the end, let’s hope that one of the lasting legacies of the Mueller investigation will be more people catching on that some of the wealthiest Americans employ shady financial practices at the expense of everybody else, and that they should be watched much more closely in the future. 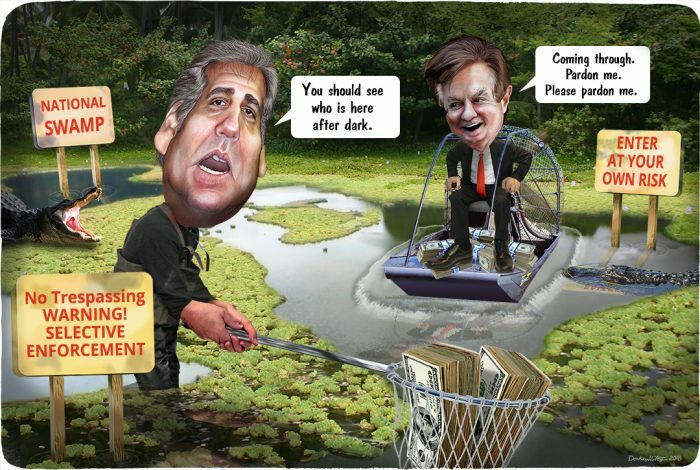 The cartoon above was created by DonkeyHotey for WhoWhatWhy from these images: Michael Cohen caricature (DonkeyHotey / Flickr – CC BY-SA 2.0), Paul Manafort caricature (DonkeyHotey / Flickr – CC BY 2.0), airboat (USFWS Mountain-Prairie / Flickr – CC BY 2.0), waders (Zeesenboot / Flickr – CC BY 2.0), alligator 1 (cuatrok77 / Flickr – CC BY-SA 2.0), alligator 2 (cuatrok77 / Flickr – CC BY-SA 2.0), and money 1 (Barta IV / Flickr – CC BY 2.0), money 2 (Andrew Magill / Flickr – CC BY 2.0).